If ever you feel the need to invite a big fan of yours to your lovely abode in the Hamptons and fill her up with fine cheeses and wine, I wouldn’t be opposed to accepting your invitation. Just saying. P.S. Tell Jeffrey I said hello. Though I truly love the Midwest and wouldn’t want to live anywhere else for the rest of my existence, I sometimes get wanderlust to places like Greece, or Australia, or even the Hamptons. Kelly Ripa talks about it all the time; I’m pretty sure there’s some version of “Real Housewives” set there; and I wouldn’t complain about wearing the obligatory over-sized floppy hat. And, of course, Ina Garten lives there (I think — I haven’t stalked her enough yet to know for sure, but wherever she lives is magical). Plus, if I lived in the Hamptons, I would get to eat fancy-schmancy crackers like these all day long, complete with a glass of wine (which I hear, in the Hamptons, is perfectly acceptable to drink at 11 o’ clock in the morning). But for now, I’m stuck here, with a cornfield instead of a coastline. But at least I can still have the crackers. I don’t know what inspired me to bake crackers this time. Maybe it was the wall of cheese at the co-op that fascinates me so (What a bounty of cheese! Such variety!). 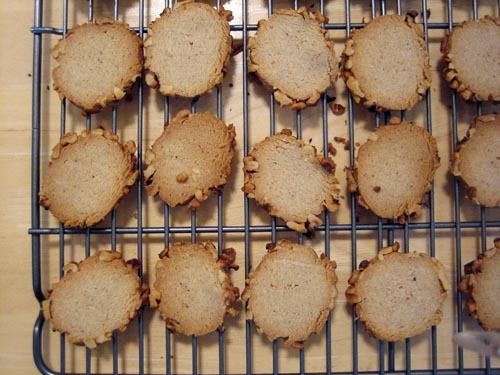 Maybe it was the practicality of making crackers as opposed to stollen or lebkuchen. Whatever the reason, the result has left me and my husband happily full in the hours between meals. And, as my friends well know, a full Steph is a happy Steph. 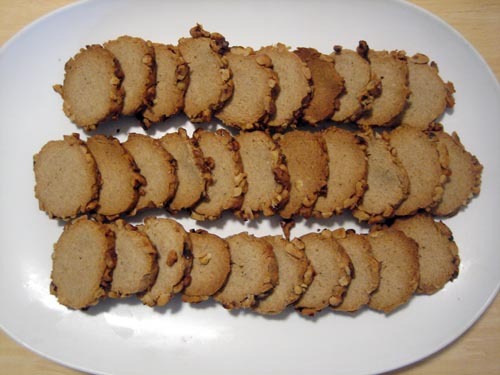 Debrief: These crackers are very versatile. If you don’t like the strength of blue cheese, try cheddar and chives. Or parmesan and thyme. Or rosemary and… manchego, perhaps? 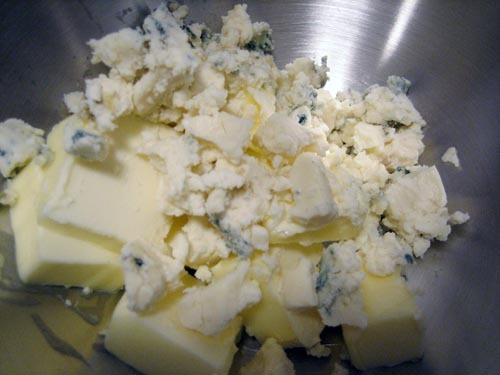 In the bowl of an electric mixer fitted with the paddle attachment, cream the butter and blue cheese together for 1 minute, or until smooth. 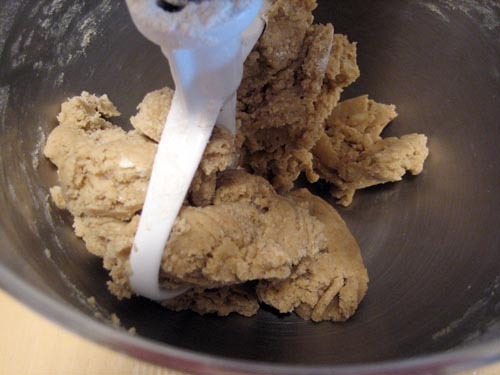 With the mixer on low speed, add the flour, salt and pepper and mix until it’s in large crumbles, about 1 minute. Add 1 tablespoon of water and mix until combined. 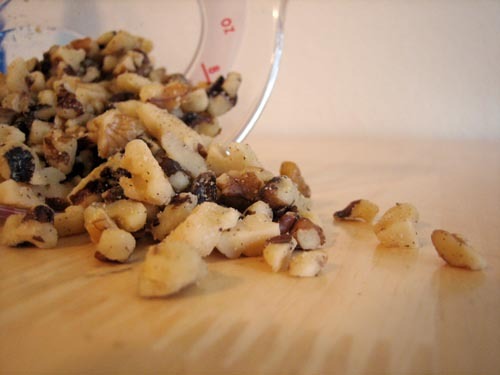 Extra punches: I’d suggest chopping the walnuts really well before coating the crackers. 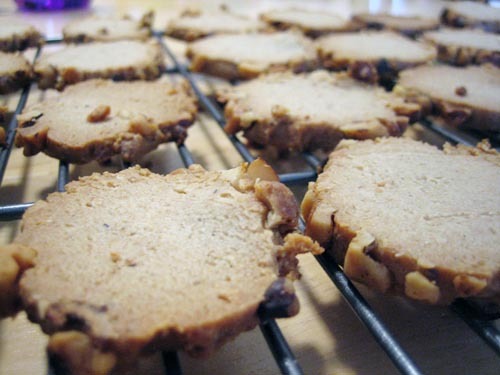 As you can see with mine, the pieces were a little big and had trouble sticking to the sides of the crackers. 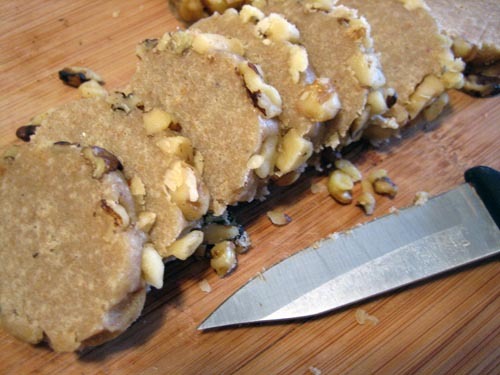 They still basically stuck, but I think a coating of finely-chopping walnuts would not only look prettier, but would also save you the headache of trying to keep them stuck to the edges. 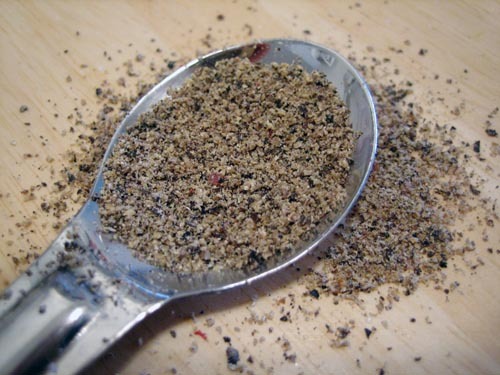 Next Post » Sifted Words — Would you like to Tablespoon with me? Those look delish! And I LOVE Ina Garten, she’s my favorite 🙂 Great minds, I tell ya. So glad I just found you on Twitter. Cant wait to read more! Those look amazing!! I love the Barefoot Contessa. I’ve never gone wrong with one of her recipes.